The latest addition in Springer’s ongoing series Astrophysics and Space Science Library is Planets in Binary Star Systems. The book represents an excellent introduction to ongoing research into the existence, formation, evolution and potential habitability of planets in binary and multiple star systems. 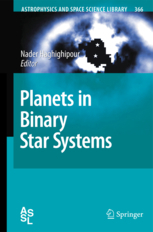 Editor Nader Haghighipour has succeeded in soliciting a series of articles from excellent researchers spanning both the observational and theoretical aspects of the study of planets around multiple stars and, as such, the book gives a fantastic overview of the newly emerging field. In the brief summary on the back of the book, the editor states “This volume seeks to gather the current research in the area of planets in binary and multistar systems and to familiarize readers with its associated theoretical and observational challenges.” Over the ~330 pages, and 11 chapters, the book does exactly that. One of the benefits of inviting so many disparate groups to provide chapters for the book means it gives a great over-view of the competing methods used to detect planets around distant stars, as well as covering the various competing models used to explain their formation and evolution. Beyond this, the chapters themselves each stand alone, meaning that a significant amount of introductory material is covered in each chapter – with some overlap from one chapter to another, where appropriate. Whilst that might sound somewhat wasteful, and repetitive to read, it actually makes the book easier to handle – no chapter requires you to first read another to fully understand its contents, but the whole is definitely greater than the sum of its parts. It also helps foster understanding of the basic principles – if one explanation doesn’t quite click, a different viewpoint on the same question is likely to crop up in another chapter, which should hopefully make things crystal clear. The early chapters of the book concentrate primarily on the observational side of exoplanetary science, and contain great detail on the various techniques used to detect and categorise both planets and disks around binary stars (and by extension, around stars in general). The authors typically then give an overview of their own research, as well as setting out the case for future developments in each sub-field. The central chapters of the book move on to the modelling of planetary systems – discussing in some detail the different models for planet formation in multiple star systems, and showing how the two different paradigms for planet formation (“Core Accretion” and “Gravitational Instability”) proceed within such systems. After a detailed and mathematical segue into the details of N-body integrators for planets in binary stars systems, the book finishes with two chapters discussing the more astrobiologically interesting aspects. These include the formation of, and prospects for habitability of, terrestrial planets in binary star systems, finishing the book off in forward-looking and optimistic style. All together, Planets in Binary Star Systems represents a superb introduction to exoplanetary research as a whole, particularly that subset of it that involves multiple star systems. The authors have managed to bring a broad perspective on the subject, and have typically managed to present their material in an engaging and clear manner, making it an ideal book for anyone just embarking on research in the field, whether they are observers or theorists, or indeed anyone looking to refresh their understanding of planet formation or detection.